In the dizzying overwhelming choices of costume shopping, to manifest who you want to be, count on us for a curated, streamlined selection of the best Halloween costumes! Trendy Halloween is an online Halloween store that's passionate about the holiday just like you. The products we carry and the relationships we develop with our customers enrich our tight-knit company culture. We live in the pretend and sharing our love for Halloween has us going home fulfilled and motivated to work even harder for you. Our company has been successfully active since August 2010, with no signs of slowing down. We thank you our loyal customers for making this possible. Who hasn’t stepped foot inside a costume shop only to grow dizzy with the huge array of costumes? You know the feeling, you walk into the costumer’s shop, sometimes not even knowing what you want, only to be visually bombarded with 1000s of costumes – you get excited because you finally have a reason to pretend role play – but you feel overwhelmed because you can’t decide. Trendy Halloween's online collection alone grows to over 20,000 SKUs during the Halloween season... imagine the millions of possibilities!? That's why we whittle down all the work for you with a curated selection of quality costumes and decorations at competitive price points. A year-round source for costumes, accessories and decorations ready for everyday costume play for all ages. If it's your child with a very active imagination that wants to play dress up or you yourself looking for a risqué role-playing session, Trendy Halloween has you covered. Perhaps you've landed the starring role in a theater house or stage production and are in need of something for your character, we've got your back. Maybe it's your birthday and you want to theme it up? - yep, count on Trendy Halloween for endless theme ideas! Our hottest-selling brands range from blockbuster superheroes like Avengers, to Harry Potter - from classics like Star Wars, Disney Princesses, Alice in Wonderland and Hello Kitty - to trending new characters from television phenomenons like Game of Thrones and The Walking Dead. Count on us for staple genres like Steampunk, Vampires, Witches, Zombies, Fairies and Career Costumes. We're ready (with ample sizes) to outfit your whole family, as a couple with your significant other or for you as the lone cowboy looking to blaze the dusty trail alone. You can gather with us your building pieces for your next Cosplay outfit or burlesque session from our impressive costume selection online. None of the above? Our costumes are worthy of your next performance art event, movie or stage production. Even video bloggers find inspiration with our wigs, costumes and makeup – all tutorial ready. Still not your thing? How about a photo shoot session in one of Trendy Halloween’s funny costumes that can help your channel go viral or even inspire you to create one-of-a-kind memes. Trendy Halloween operates from Southern California by a family lineage of professional costume curators and fashion forecasting experts. 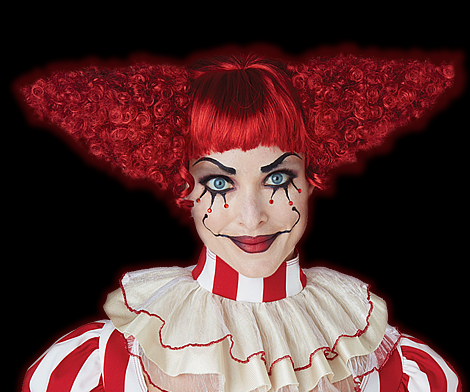 We carry all the leading costume and decoration manufacturers such as Leg Avenue, Rubies, Disguise, Morris, Zagone and Ghoulish Productions to name a few.